Ask about any yoga teacher, and they'll tell you that their teacher training was one of the best experiences they possibly could have had. It's literally life changing. I can just about guarantee it. There's no way around it: yoga teacher training is hard. There's a lot of feels, a lot of work, and a lot of stuff you don't want to think about can get dredged up. However, all of that makes it incredibly rewarding, and that much more emotional when you finally graduate. Plus, you get to talk about yoga all day. One thing that can make it even better (yes, it's possible) is doing your teacher training abroad. Here are five reasons you should definitely do just that. I know myself, and I know that if I had done one of those long, drawn out YTTs in my hometown over the course of six months, I very well might have gotten bored and given up after month two. If you're like me, and are much better at doing something in one fell swoop, maybe take your YTT abroad. The chances are much higher of it being an intensive program over the course of a month or so. And it's pretty cool to think that when you come back after being gone for a month that you'll be yoga certified. 2. Make a Vacation Out of It! 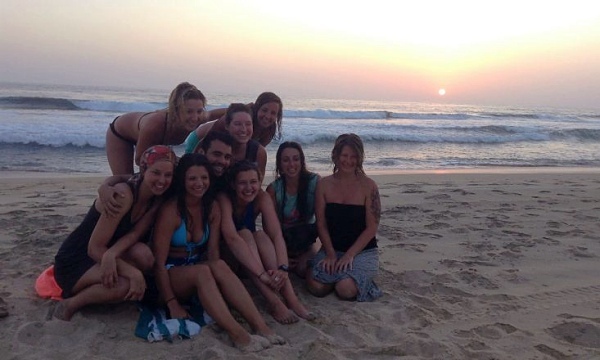 If you've got the travel bug (and I do, bad), doing your yoga teacher training abroad is a great excuse to go somewhere new and make a vacation out of the experience. If you can, try taking a few days either before or after your training starts. Take the time to explore the area around you. Immerse yourself in the culture, food, and sights of wherever you are. Doing so will really get you in the mindset of being there, away from the things you know. It's a great frame of mind to be in before your training, as it's rather "blank slate"-ish. One advantage to not having an international plan on your phone, is that when you get to your training, your phone just doesn't work. It is absolutely the best, easiest way to disconnect. My dumb phone (instead of smart phone. Get it?) didn't have an international plan, and since I knew it wouldn't work, I just left it at home. I told everyone before I left that I would be totally unreachable for a month, and that I was completely logging off. No Facebook, no Instagram, no calls. It was absolutely perfect. Leaving your phone at home keeps you completely within the training. You're truly there, living and experiencing without any distractions. There was a lot of good stuff that happened at my YTT, but being disconnected from the outside world is probably one of the best parts. If you go abroad for your teacher training, chances are that almost everyone else there will have traveled for training. This rocks because no one is from there, and everyone is a stranger. At my training, there were people from all over the United States, Canada, Mexico, France, and Germany, so it was an international experience in every single way. Everyone came together to be in this place because of our love of yoga. There was an instant connection between us because of that. We didn't know each other going in, but came out the other end a family. In those twenty-seven days, we did everything together. We talked, laughed, shared, practiced, and were each other's confessors. I know some of the people from my training better than friends I've known for years. It also doesn't hurt that now I have places to stay all over the world. Nothing really beats being able to say, "that one time I lived on a beach in Mexico for a month." Following up with saying you were there for yoga teacher training only makes it cooler. But in all seriousness, you get some really great tales out of it all. From meditation walks in landscapes you never thought you'd see, to that one free-roaming cow that would wake everyone up at 2 a.m., to watching the sunset together on the beach. You experience so much in so short a time that when you get home, you won't be running out of stories any time soon. Have you done a teacher training abroad? Share some of your stories with us below!